Mount Sinabung spewing thick ash during its eruption as seen from Tiga Pancur village, in Karo district of North Sumatra, yesterday. Eruptions regularly disrupt air travel around the archipelago. Mount Sinabung in North Sumatra's Karo District in Indonesia erupted on Friday spewing thick ash that has forced the closure of two main routes leading into the Red Zone. According to the sources, the volcanic earthquake has continued to occur with eruptions of the ash cloud that goes as far as 3.000 meters from the crater. 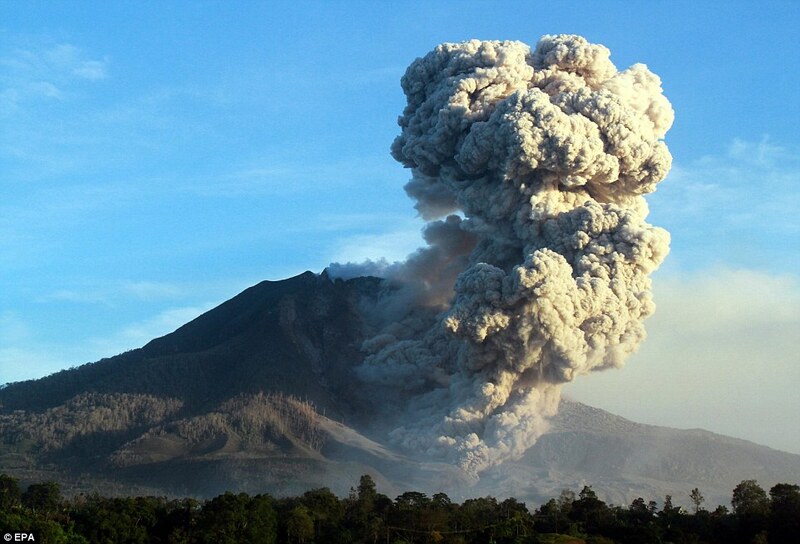 Mount Sinabung is a highly active volcano on Sumatra Island. Sinabung is regarded as one of 129 active volcanoes in Indonesia, which is located on the Pacific Ring of Fire, a belt of seismic activity running around the basin of the Pacific Ocean. This particular Pacific Ocean basin is the home to around 130 active volcanoes and eruptions regularly disrupt air travel around the area. Residents and visitors have been advised not to go within a three-kilometer radius of the crater since July of this year. The agency also plans to evacuate people living in close proximity of the volcano, in the so-called red zone. "Those areas located in the red zone are a very dangerous and need to be evacuated," an official said. He added that 2,592 households have already been evacuated to nine posts the agency had set up, while another 1,682 families from four villages are still being evacuated. "People are advised to comply with all restrictions. The red zone is a very dangerous area, so nobody is allowed to enter those areas," he said.